The Panametrics-NDT™ Model 25 MULTI PLUS is an advanced ultrasonic precision thickness gage with several unique measurement capabilities. 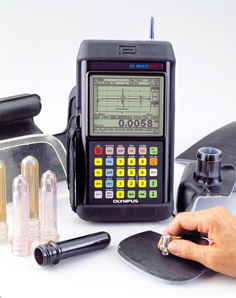 In addition to making thickness measurements on metal, plastic and many other materials with varying thickness ranges, the 25 MULTI PLUS has the ability to calculate and simultaneously display up to four separate measurements. The Summation Mode accurately displays total thickness of selected layers. Another unique feature of the 25 MULTI PLUS is the Barrier Layer Mode. This feature makes it possible to measure critical barrier layers in multilayer plastic parts such as gas fuel tanks and bottle preforms. This special Mode displays the thickness of thin barrier layers that are typically too difficult to measure with conventional ultrasonic thickness gages because of lack of separation between the echo from the front and back of the barrier layer. The 25 MULTI PLUS calculates and simultaneously displays thickness measurements of up to four individual layers. It also displays total thickness of selected layers.The 25 MULTI PLUS measures thickness of barrier layers in applications such as plastic fuel tanks and bottle preforms. Mode 3: Time interval between successive backwall echoes following the first interface echo after the excitation pulse, using delay line or immersion transducers. Thickness range depends on material, transducer, surface condition,temperature, and SETUP selected. 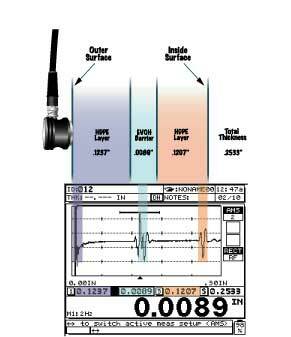 Simultaneously displays up to four thickness measurements. Summation Mode: Displays the sum of up to three layer thickness measurements. Stored Standard Setups: 25 stored transducer setups to allow fast, easy calibration for our standard transducers. Size: 9.375" x 5.45" x 1.5"
Datalogger and RS-232: Identifies, stores, recalls, clears, and transmits thickness readings, waveform images, and gage setup information via the RS-232 Serial Port. Baud Rate, Word Length, Stop Bits, and Parity are adjustable from the keypad. Reports: On-gage reporting of summary with statistics, Min/Max with locations, and File Comparison. On-screen comparison of current and previous readings. Model 25 MULTI PLUS Digital Ultrasonic Multilayer Thickness Gage, AC or Battery Operation, 50-60Hz, with Internal Alphanumeric Datalogger. 2213E" 5-Step Test Block, Aluminum, English Units: .100", .200", .300", .400", .500"
Please contact us for other accessories available with the Model 25 MULTI PLUS.